CENTENNIAL VALLEY, Montana -- America's Great Divide Mountain Bike Route is a series of rural backroads from Banff, Alberta, Canada to Antelope Wells, New Mexico that together form a premier route for adventurous bicyclists and, increasingly, motorcyclists. Following a network of primarily unpaved backways, it traverses some of the most rural regions of the Rocky Mountain West. At its northern end, it parallels the Continental Divide -- and the Continental Divide Trail for hikers -- as it winds through western Montana, not far from my home in Idaho. Judging by the number of ride reports by adventure motorcyclists -- ADV riders, they are called -- it seems that more and more backroad travelers are taking the route each year. As an ADV rider and backcountry driver myself, I became curious about the route in the summer of 2009, and decided to have a look. In reading about it and looking at maps, I sensed that travelers riding the route on motorcycles were missing much of what the land of a Big Sky offers. After all, they following a route that accommodates pedal power. Horsepower provides more options. So I journeyed north on my KLR650, a dual-sport motorcycle, and in my four-wheel-drive Toyota 4Runner to explore the route in Montana, and routes I thought might offer motorized travelers even more. Looking through my Benchmark-brand Montana Road & Recreation Atlas, the best of that genre, I spotted several intriguing backcountry roads. 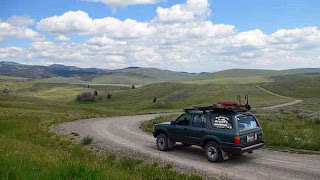 They traversed the vast region encompassed by Beaverhead-Deerlodge National Forest. The region south and east of Dillon, on Interstate 15, to the lofty 9,500-foot crest of the Gravelly Range was particularly alluring. My research included the area north of Red Rock Pass Road, which passes through a national wildlife refuge in Centennial Valley, on the northern flank of the Centennial Mountains and the Continental Divide. I would begin most of my days of exploration at the ghost town of Monida, off I-15 near Monida Pass at the west end of Red Rock Pass Road. I found a gem in Blacktail Road, a lonely dirt road through pastoral rangelands, rolling hills and low canyons along a meandering little river by the same name. The road runs southeast from Dillon for upwards of 60 miles to cross the Red Rock River and connect with Red Rock Pass Road in Centennial Valley. From Centennial Valley I followed Centennial Divide Road (100) north to the Ruby River, then turned east into the Gravelly Range, and climbed to Eureka Basin on road No. 347. Climbing from Eureka Basin, the road led me to Gravelly Range Road, the crown jewel that follows the north-south crest of the Gravellys, ascending above 9,500 feet. This single-lane road proved ideally suited not only to my 1990 Toyota 4Runner, which can handle much worse, but also my dual-sport motorcycle, which isn't well-suited to the rough. There were no particularly rough segments on this easily traveled seasonal road. Continuing north on Gravelly Range Road, the looming monolith Black Butte soon dominated the skyline. There was an appealing, designated but primitive campsite near its north side, and others farther along. They promised nighttime skies crowded with stars. I vowed to return someday to camp at Clover Meadows. Road 1012, which links the valley of the little Ruby River with Gravelly Range Road, was rougher. It was rutted from past mud, rocky here and there, and bordered by trees that protruded into the roadway. Farther north, Gravelly Range Road followed the very crest of the range, with vistas extending across steep, angular mountains and broad valleys to the Divide itself. Warm Springs Road (163) was a friendly option to descend down to the pastoral Ruby River Valley and Centennial Divide Road. It's just wild enough for adventure, and hugely scenic, yet in good enough condition for comfort on an ungainly KLR650 dual-sport bike. Turning south to return to Centennial Valley and Idaho, I passed many outstanding campsites -- sans facilities -- along the Ruby River. I didn't care much for the campground at Cottonwood, however. It seemed rough, brushy and unappealing (north of it are better sites). Unfortunately, the bike route follows graveled, and scenically mediocre, Lima Reservoir Road west from the town of Lima, on I-15. That makes a logical connection between Big Sheep Creek National Back Country Byway and Red Rock Pass Road. So taking Blacktail Road, and then Centennial Divide Road to Gravelly Range Road is a major detour that isn't practical for most bicyclists riding the route. But it's very doable -- and very worth doing -- for those of who are drawn along by internal combustion. ©2009 Tony A. Huegel, all rights reserved.